The United States hold a strong 74-48 lead over Europe after the first day of the Duel in the Pool in Indianapolis. 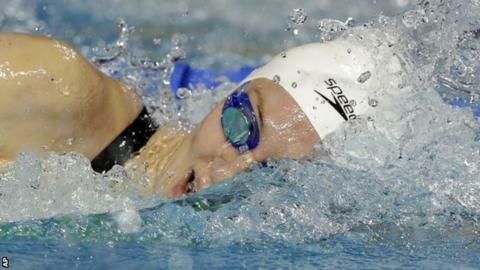 British pair Jazz Carlin and James Guy were among the Europe winners, triumphing in the 400m freestyle events. Europe will need to produce a remarkable turnaround if they are to win the event for the first time. In the individual events, five points are awarded for a win, three for second place and one for third with seven points on offer in the relays for the winners. Carlin's time of three minutes 58.07 seconds was a new personal best, beating the 3:58.81 she managed last week to win gold at the European Short Course Championships in Israel. The 25-year-old Welsh swimmer overhauled the early leader Hali Flickinger of America, beating her by 0.18 seconds with Denmark's Lotte Friis third. Guy clocked 3:37.78 in his event - his second fastest-ever time - to finish ahead of American Conor Dwyer (3:38.10). Europe's other wins came from Hungary's Katinka Hosszu (400m medley and 200m backstroke) and Denmark's Jeanette Ottesen (100m butterfly) while five-time Olympic goal medallist Ryan Lochte was among the US victors after he triumphed in the 400m medley with Dan Wallace setting a new Scottish record in third (4:04.10). Lochte also finished third behind team-mate Matt Grevers in the 200m backstroke.